Updated Wednesday, Oct. 21, 11:25 a.m. EDT: According to a tweet from Chris Rock, it looks like he's officially coming back to host! 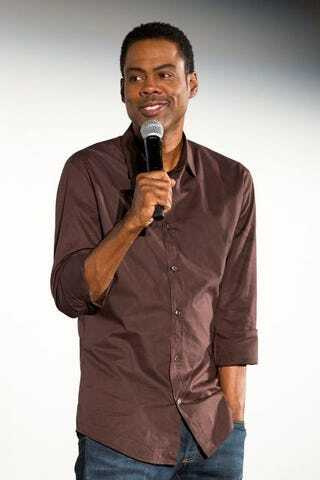 Word will likely be coming down any second now that Chris Rock has been named the official host of the 88th Academy Awards, Variety reports. It'll be the second time he's hosted; he first took the stage in 2005, when he memorably roasted Jude Law. Rock wondered why Law, an actor Rock thinks has mediocre talent, had gotten so many lead roles in movies. Law's friend and fellow actor Sean Penn got onstage and fired back at the idea, saying that Law was a talented actor. It was a testy, indirect exchange, but it looks like the academy is looking for the kind of honesty and insight that sets Rock's comedy apart from the rest. According to Variety, ratings for the 2015 Oscars fell 16 percent from the previous year. Rock is in the latter part of his career, entering retirement—the phase of his life when he's going to say exactly what is on his mind because he feels he's earned the right to do so. Perfect timing to host the Oscars. Plus, Spike Lee will be getting an honorary Academy Award for Do the Right Thing, so Brooklyn will definitely be in the house if Rock gets the gig.